Happy memorial day weekend folks! Whether you’re at a backyard BBQ, a breezy beach, a lovey lakeside or somewhere else you can still enjoy the weekend… by saving BIG on some of your WordPress favorites! We’ve taken the time to find the best deals for you so you can save fast and get back to enjoying the long weekend. Save 33% (that’s $20 off) on the Total WordPress theme – no code needed. This offer ends soon, so grab this top selling premium WordPress theme (which comes with a drag & drop page builder, 40+ easy import sample demos, premium support, WooCommerce compatibility and more) for just $39 while you can. Save 20% any premium theme or membership from cssigniter with their spring special! Just use code WORDPRESS at checkout. Offer ends soon. Gorilla Themes spring sale is going on! Save up to 15% on standard, premium and deluxe theme packages. Just use code TROPICAL at checkout. Offer ends soon. HappyThemes is offering 40% all theme memberships (which include unlimited use licenses for more than 20+ themes) with code SPRING2018. Offer ends soon. Everything is on sale at Imagely, and right now you can save 20% on all of their Photography WordPress themes with code SAVE20. Offer ends soon. Get 20% OFF any of Themify’s awesome themes (including their mega multipurpose theme Ultra) with code HAPPYWEEKEND! Offer ends soon so act fast. Themetrust is having a massive spring sale – 30% off your purchase when you use promo code SAVE30. Offer ends soon. Get the WPZoom All Themes Package (which includes 37 WordPress themes Themes) for only $99. No code needed. Offer ends soon so save while you can! 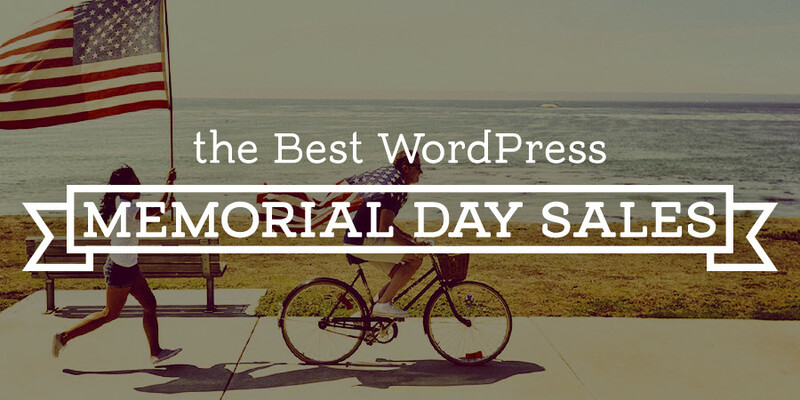 Get 50% off your WPEka Platinum Plan club membership (which gets you access to over 80+ premium WordPress goods) this weekend only with code MEMORIALDAY. Offer ends May 31, 2018. Save up to 60% when you signup for new web hosting for just $2.95/mo (for a 3yr plan) at Bluehost. No code needed. Offer ends soon. Get 20% off your new purchase of a domain, hosting plan, SSL or anything from Domain.com with coupon code NEWSITE. Offer ends May 31, 2018. Save 20% on any new purchase from Dotster.com including domains, hosting, SSL and more with code NEWSITE. Offer ends May 31, 2018. Right now you can get GoDaddy shared hosting starting at $1/mo with certain plans. No code needed. Offer ends soon. Save big and get your new domain registration from GoDaddy for $0.99 for the first year. No code needed. Offer ends soon. Save 30% on your next purchase from GoDaddy when you use our link. No code needed. Offer ends soon. For a very limited time you can get started creating your website with HostGator shared, VPS, WordPress or dedicated hosting for as much as 60% off. No code needed. Offer ends soon. For a limited time you can get 2 months free when you purchase a new annual hosting plan from Media Temple. No code needed. Offer ends soon. For a limited time save $15 on Stellar Business hosting plans at NameCheap with code SPRINGDAY. Offer ends May 31, 2018. For a limited time save 15% on Stellar and StellarPlus hosting plans at NameCheap with code STELLARHOST. Offer ends May 31, 2018. Get 40% off your purchase of a new Reseller hosting plan from NameCheap with code SMILE40. There’s no better time to start your own hosting business. Offer ends May 31, 2018. Save up to 10% off com, net, org, biz registrations/transfers during May with code YAYMAY. Offer ends May 31, 2018. Save 20% off your first payment with code wpe3off. Offer ends soon. aMember Pro Spring Sale −17% off with code 76ECF909. Offer ends soon. Get 10% Off on Envira Gallery – Use Coupon Code: SAVE10. Offer ends soon. Save 35% Off the iThemes Plugin Suite, which includes which includes unlimited use licenses for BackupBuddy, Security Pro and the iThemes Sales accelerator and more. Use code PLUGINS2018. Offer ends May 31, 2018. [coupon heading="OptinMonster 10% Off" url="http://www.wpexplorer.com/out/optinmonster" button_color="red" button_text="Save 10% at OptinMonster"]Get 10% Off on OptinMonster – Use Coupon Code: SAVE10. Offer ends soon. Get all of SeedProd’s plugins (including Coming Soon Pro, Viral Giveaway Pro, Notification Bar Pro, etc) for just $99. No code needed. Offer ends soon. Get 20% Off on Soliloquy – Use Coupon Code: SAVE20. Offer ends soon. WPForms Get 20% Off on WPForms – Use Coupon Code: SAVE20. Offer ends soon. Take 10% off your new Vimeo subscription when you use code MAY10DEAL at checkout. Offer ends May 30, 2018. Save 25% on Vimeo Plus, PRO, Business, or Premium accounts this Memorial Day weekend! Just enter code MEM25VIM to save. Offer ends May 28, 2018. Hopefully we’ll have a few more deals to add as the weekend goes on. And as always with our roundups if you find a deal we want to hear about it! If you have a deal we should add let us know in the comments below and we’ll get on the list as soon as we see it! WordPress vs Blogger – Which is Better for Your Blog?